In 1941, Division 2 (Intelligence) of the Army General Staff Office established Toho-sha to create a tabloid size graphic magazine to communicate the culture and power of Japan domestically and abroad. When the first issue of FRONT was published in 1942, it displayed the latest print technology on tabloid-size gravure paper. FRONT was supposed to promote Japanese culture during peaceful times, but the rapid plunge into full war changed its mission to trumpeting Japanﾕs might. 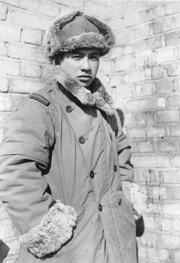 Hayashi entered Toho-sha in 1943 after completing three years of army service. The airplane-loving Hayashi was happy to risk boarding training planes to photograph bombers. On September 19, 1945, Japan Film Corporation producer Ryuichi Kano asked Ihei Kimura, head of Toho-shaﾕs Photography Division, to supply two still photographers to the academic survey teams. It was decided that Kikuchi would join the medical sub-team, Hayashi would join the physics sub-team, and Tsuneo Tago, an employee who was still a student, would go along as an assistant. Hayashi and the others departed Tokyo on September 27. they began studying the damage on October 1. Hayashi took photos during the Nagasaki survey and returned to Tokyo on the 23rd. In 1982, about 550 photographers set up an office for the Anti-Nuclear Photography Movement. They gathered photographic records of the atomic bombings, published collections, and held photo exhibitions as a means of promoting the anti-nuclear movement. Hayashi was an enthusiastic participant. Taking leadership of the Steering Committee in 1984, he worked hard as a liaison among photographers collecting and preserving precious original prints and negatives. Born at Kami-osaki, Shinagawa-ku, Tokyo. Graduated from Azabu Junior High School. Graduated from Tokyo Professional School of Photography (now, Tokyo Polytechnic University). Entered Yokohama Cinema Film Processing Company. Drafted into the army. Stationed for three years near the border between the former Soviet Union and China. Dispatched to Hiroshima and Nagasaki as a member of the Special Committee for the Investigation of A-bomb Damage. Quit Toho-sha in August of that year. Established Toyo Kobo. Thereafter worked as a commercial photographer. Held A-bomb photo panel display at conference for anti-nuclear groups in New York. Became founding member of and helped open an office for the "Anti-nuclear Photography Movement." Became chairman of the Anti-nuclear Photography Movement. Entrusted film and original prints to Hiroshima Peace Memorial Museum and Nagasaki Atomic Bomb Museum.